Another day exploring the Chatham Islands.. today we went hunting for Shark Teeth fossils.. found a few tiny ones.. also went to a beautiful garden with some Chatham Island For-get-me-nots.. and then to the Basalt columns.. amazing rock formations.. These beautiful kelp 'flowers' made a great contrast in the boulders. A great find, composition and shot. Sounds like a wonderful outing. Love the selective color -- weather natural or processed. Are these pumice stone rocks? @taffy this is very much straight from the camera.. no processing done here..
Great contrast between the flower and the rocks. Interesting color too. Nice textures. We have lots of those on our beach! Love the feeling of sea & shore this photo gives you. Beautiful flower & nicely arranged! very cool, nothing better than exploring rocks by the sea side. 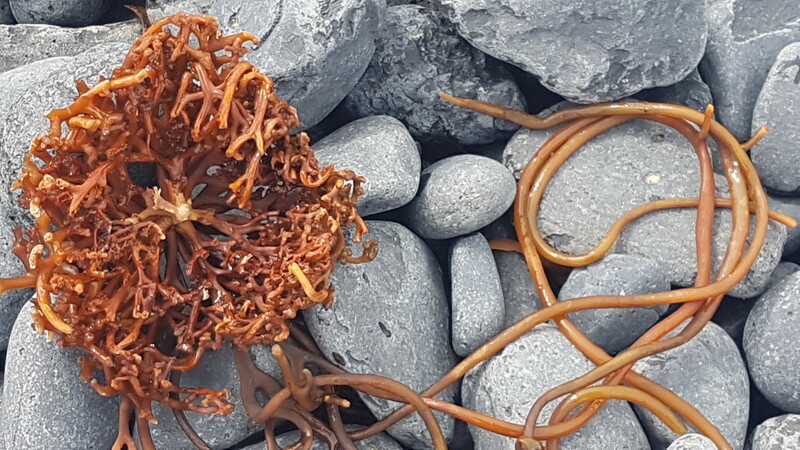 I like the contrast between the kelp and the stones in several respects. I got my seeds and omg they work out to $4.50 each!!! Oh well, now I have to work out how best to pot them up for sprouting. The online instructions (from the UK RHS) recommend autumn for seeds. Waddya think? All suggestions gratefully received. BTW, four 'KiwiPost' stamps on the envelope, not money denominations, the company charged me $25AU. Sounds excessive to me. A pity, cos I won't give them any more business. Wow.. that is excessive.. I have seedlings popping up after flowering.. so I guess it is Autumn after they have ' rippened' .. last years seedlings are about 2inches high now..